Since I've basically brewed every other beer style in the BJCP guidelines, it only makes sense that I try my hand at sour & funky beer brewing. As the years have gone by, I've brewed a good number of successful sour attempts. Some have been more acidic than I have intended, but that's where blending (something I haven't attempted yet) would come in handy. Several commercial breweries use this method in order to create a more balanced sour beer that still has some malt and base recipe characteristics. Some of the commercial offerings that really sparked my interest were New Belgium's La Folie, all the Jolly Pumpkin's sours I've sampled, Boulevard's Saison-Brett, Bell's Wild One, and recently Ommegang's Aphrodite. I've also had the opportunity to visit both Crooked Stave & Funkwerks in Colorado, and both of those breweries are awesome! - Great resource for information regarding sour beer brewing as well as a good list of recipes and detailed tasting notes. I would suggest subscribing to his email list as well so you can keep up with his latest projects and recipes! - Lots of interviews with sour brewers all over the world and a ton of good information overall. - Hasn't been as active over the last couple years, but there is a good amount of information in his older posts and recipes. There aren't a ton of published books geared towards brewing sour beer at home, but the ones below have been great resources for me! I always enjoy reading about new and different techniques as well as the history behind sour brewing and traditional methods. While this is more of a Farmhouse beer than a true sour, I think it belongs here. Since I had good luck with the Omega OYL-212 Brett Blend, I decided to try out their C2C American Farmhouse (OYL-217) yeast a try. In the product description, it mentions that this yeast blend has a strain of Brettanomyces in it, so we'll see how this one ages. I was in the mood to brew a Barleywine, and I thought a sour was the perfect way to get a beer essentially for free. With this batch, I did a very short boil so I was able to boil and cool the sour before I needed to use the wort chiller in the BW. After the initial fermentation, I added 4 lbs of frozen mixed berries that hand been crushed up. This was another recipe where I wanted to compare two different sour blends (WLP655 and OYL-212) as well as save the yeast cakes for future sour batches. At kegging, the WLP655 had more of a tart and light hay note whereas the OYL-212 seemed more restrained with a slight bit of leather. Hopefully the OYL-212 batch develops more tartness and complexity over time. The overall impression on this sour was light, with subtle floral notes from the hibiscus. I ended up serving this at a party and it went over well with most people. Since it was served fairly young, the tartness/acidity was much lower than it would have been if I had aged it another several months. I wanted to do a side-by-side comparison of White Labs Belgian Sour Mix (WLP655) and Wyeast Belgian Lambic Blend (3278) to see if I noticed much of a difference in the flavor profiles. I'm still waiting on this one to see how the two compare to each other side-by-side, but both had nice acidity at kegging. In my search for different yeast/funk/sour blends, I ended up coming across a couple strains from Omega Labs. The Brettanomyces Blend #3 (OYL-212) seemed right up my alley as far as being one of Omega's funkiest blends. I decided to brew a light blond wort to basically act as a 5-gallong yeast starter so I could harvest the yeast cake. The beer ended up being really tart overall, and it seemed to sour much faster than my other blends. Overall, I like the tart flavor profile of this yeast blend, but with a neutral base like this, it would probably be best if blended with another beer to add complexity. For this batch I decided to pitch a new Belgian Sour Mix (WLP655) and then save the yeast from the primary yeast cake. I had taken the previous one out a few generations and it seemed to be becoming more one-dimensional, most likely because one of the bacteria or wild yeast strains was outgrowing the rest and the ratio of bugs/wild yeas/yeast was out of whack. I also tried reusing some oak cubes that were previously used with another sour to see if those would hold on to additional bacteria. It seems they didn't add much in the way of oak flavor though. Overall this was a nice beer with subtle tartness that developed more over time. This sour was definitely special for me. For the added wine, I used a bottle of Temparillo that my wife and I received in Mexico the first time we visited. It had somehow been buried in the back of our liquor cabinet, so when I found it one day while I was cleaning, I thought this would be the perfect use. 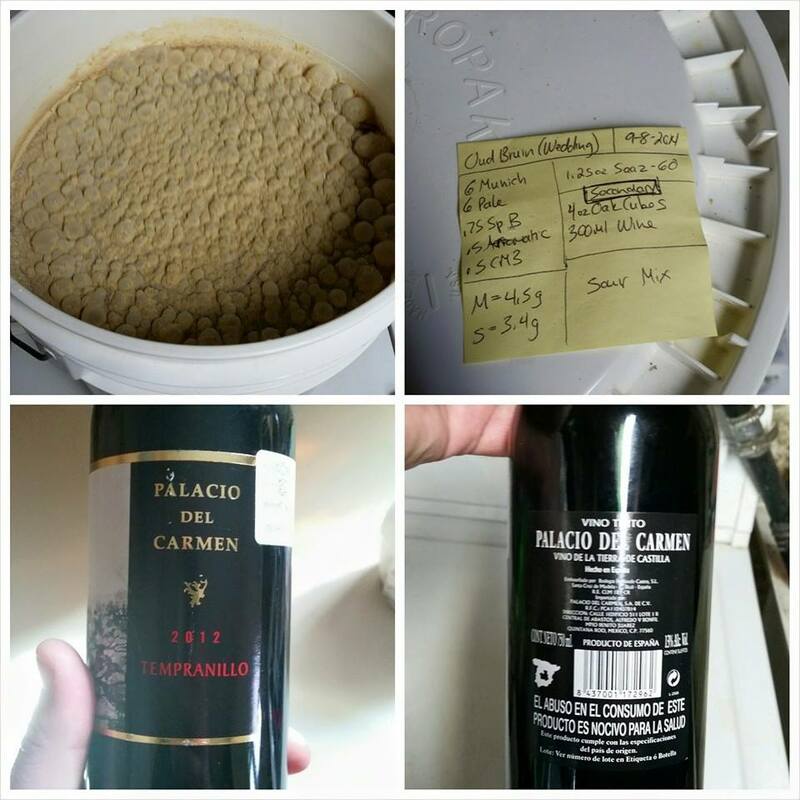 I used the wine to age the toasted oak cubes and added both the wine and the oak to the secondary fermenter. The tartness was lower than I was expecting right before the wedding, so I ended up adding just a little lactic acid to up the acidity. This beer was a big hit at the wedding, with a surprising number of guests coming back for multiple (small) glasses. I ended up pitching both Brett C and Belgian Sour Mix into this beer to see how the two would play together and have yet another mix to save afterwards. After aging on the hibiscus, the beer had a subtle tartness with some hay notes. I'm not sure that the actual hibiscus adds any flavor, but it does provide a nice rosy/pinkish color to the beer. The pineapple in this particular sour didn't add a ton in the way of pineapple flavor, but there was a subtle hay note along with maybe just a touch of an actual pineapple note. Using the WLP655 Sour Mix really helped produce a pleasant and balanced tartness. Before adding the pineapple chunks, I saved the yeast cake into a few plastic bottles to use later. The Cream Ale portion of this concentrated batch didn't turn out very well due to there being a little too much bitterness with the base recipe, but the Brett C Pale was much better. The fruity notes complimented the lighter base and the hops were better paired up with this funky strain as with previous hoppier beers. As mentioned before, this isn't actually a strain of Brettanomyces so the character of this Saison was more on the fruity side rather than funky/sour. That being said, the beer was still a success and was well received at my birthday party in June. After reusing my WLP665 (Belgian Sour Mix) and Wyeast 3278 (Belgian Lambic Blend) mixed cultures for a few generations, they were starting to show some single-strain characteristics, so I decided to brew a batch of beer and pitch both into one beer. This resulted in an interesting combination of the two mixes with the typical sour cherry notes, but this particular batch was missing some of the more earthy brett notes. Although it was determined that this strain wasn't actually Brettanomyces, this strain of saccharomyces still produced tropical fruit notes of pineapple that are very similar to Brett-C that I used in a previous batch. I need to get a hold of this yeast again and see how it performs in other styles. As with other sour recipes and general experimentation, my Concentrated 10 Gallon Method works pretty well for creating different sour beers from one shorter brew day. The apple batch had the same hay-like notes as previous fruit beers, while the chocolate half played nicely with the natural cherry notes from the sour yeast blend. Overall, this was a great comparison between what different ingredients can do to the same wort. The sour notes in this batch were a little less than expected, but I think that's because I forgot about the fermenter in the basement, and the bugs were just working a little slower than usual. The berry mix ended up creating a nice balance to the tartness that developed with time. As I noticed with the Funky Cider, this fruited batch also seemed to have more wet hay notes, so I'm pretty sure that character is coming from the fruit being added. This was definitely a fun experiment! There was a new strain of Brettanomyces released to homebrewers that was supposed to produce more fruity (pineapple) notes rather than the barnyard notes typically associated with Brett. Several people were trying this out with hoppier pale ales & IPAs, so I decided to try it myself as well. The results were definitely as expected. This funky beer shouldn't be aged as long as a traditional sour, as the pineapple notes appear much earlier in the fermentation & maturation period. NOTE: I saved the yeast cake in two plastic soda bottles so I can use it later in other batches. I've also experimented with blending multiple sour yeast blends together as well. 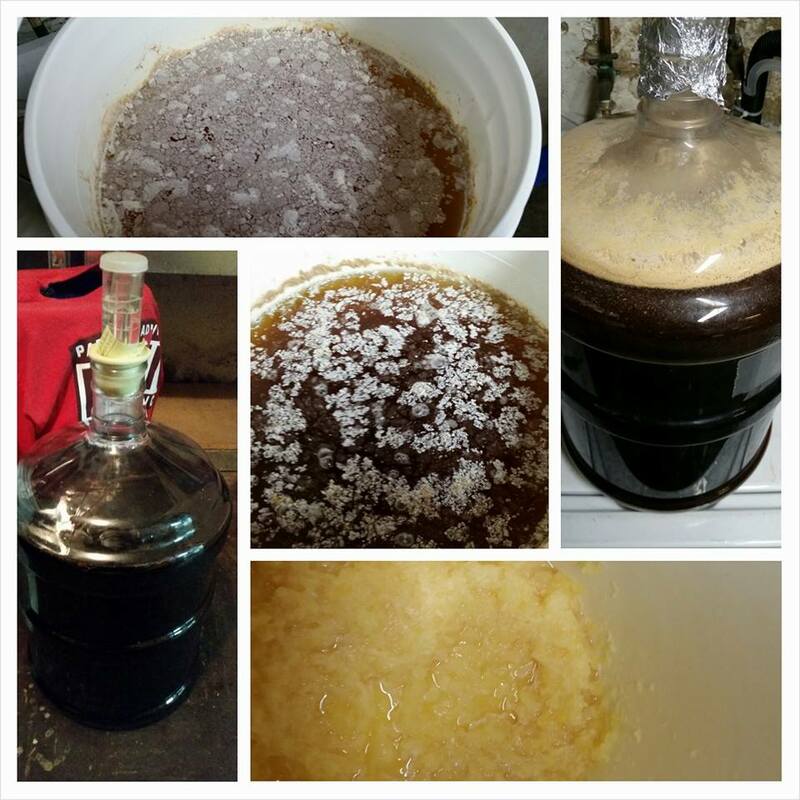 This was the first sour I brewed using my Concentrated 10-gallon Brewing Process after selling my full 10 Gallon All-Grain System. Even though I brewed the same wort for both batches, I was able to compare two different sour yeast blends along with adding some hibiscus to one batch. The differences are all listed out in the recipe, but I definitely noticed a barnyard/entaric flavor from the Lambic half for a while. I even brought a sample to one of my BJCP National judge friends, and he confirmed that there was definitely some off notes about the lambic. Luckily he gave me great advice and said to just let it sit for a few months and the bugs should clean up the unpleasant flavors and aromas. I'm glad I listened to him rather than dumping the batch, because those unpleasant notes were gone in a month or so and they were replaced with a nice fruity peach-like note. Since I've brewed several cheap ciders at home, I figured why not try pitching a wild yeast blend into the juice and see what happens. After a few months, I noticed a distinct "wet hay" character in the cider that I hadn't noticed as much in the sour beers that I've brewed. It seemed that hay/barnyard note continued to develop more in the cider than with grain-based beer. I've also noticed this character on subsequent batches as well. Maybe it has to do with the fructose and other types of sugars that are present for the bugs to chew on? That's my guess anyway. This beer went through some interesting flavor and aroma stages. When I first transferred it to secondary to add oak, there was a musty/funky aroma and flavor that I hadn't experienced before. After aging a while on the oak and letting the bacteria and wild yeast work their magic, this beer developed nicely and provided a subtle tartness that developed more with age as well as that nice cherry-pit tartness that I've grown to really like. One of the benefits of brewing on a 10-gallon system is that you can split the batch into two (or more) fermenters and pitch different yeast into each. I find that brewing with Golden Naked Oats tends to give beer a slight peachy note. I definitely found that to be true in this batch, and that fruity character really played well with the cherry-pit tartness that the bugs provided. 4-8-2012: Decided to try a different style since I've already made two Flanders Reds, so a Oud Bruin or Flanders Brown seemed like a good next step. A little higher in gravity than the Red and a bit more complexity from the grains. I'm going with White Labs Sour Mix for this one since I liked the flavor produced by it vs. the Roeselare strain. 6-19-2012: Kegged and sampled. Similar to the Red #1 with subtle cherry and tart aroma and flavor. Some toasted notes from the darker grains. I was worried about this one because I checked on it after about a month and didn't notice a pellicle forming. As you can see from the pictures above, that ended up not being an issue. Hopefully I can age this one a little longer to let the sourness come out more so I won't have to resort to adding lactic acid yet again. 1-31-2012: I went with a different yeast (Wyeast Roeselare) for this batch to see if I noticed any differences between that and the White Labs Sour Mix I used on my first Flanders Red. I know I'm not aging these beers as long as I should be, but I just can't help drinking them early. I'm sure this one will be no different. 2-6-2012: Kegged, sampled, and saved yeast for future batches. The pellicle on this batch wasn't really formed as much as my Flanders #1 with White Labs Sour Mix. When I sampled the beer, there seemed to be less in the way of cherry aroma and more subtle horse-blanket/barnyard. The flavor was about the same as the aroma, and didn't have much tartness at all. Hopefully it sours up with a little aging. 7-6-2012: Well I couldn't wait any longer to try this beer, so I carbed it over a couple days and sampled it today. Flavor was similar to when I kegged it. Very subtle barnyard with very minimal tartness. So far, I'm liking the White Labs Sour Mix over the Wyeast Roeselare yeast. Like with my first batch of Flanders Red, I added some lactic acid, but closer to 2 oz for this beer since it was lacking so much tartness. 12-28-2011: Kegged, sampled, and saved the yeast cake of White Labs Sour Mix to pitch on future batches. Nice pellicle on top of the beer. Subtle cherry aroma with some lactic notes. Flavor was great with cherry pit and subtle tartness. Should be a good beer when aged for awhile. 3-1-2012: I put this beer on tap a little early because I just couldn't wait any longer to try it out. It had a great cherry/cherry pit aroma and a subtle tartness. No horse-blanket, which is fine by me. Flavor was clean and crisp with a slight lingering pucker from the acid produced. 4-5-2012: I wanted to add a little more acid to this beer since I didn't let it age out and produce enough. I decided on an ounce of lactic acid. I've used this method before to make what I called a Cheater Weiss, which was supposed to be a mock Berliner Weiss. I liked the level of tartness much better after the addition of lactic acid. 5-20-2012: Blew the keg :( This beer was a great first attempt at a sour, and the goal is to brew one every 4-6 months or so. I've dedicated a fermenter and 2 kegs to sour beers, so the goal is to have one fermenting and two aging at all times.